I absolutely love this time of year. Something about transitioning into the summer and being right on the cusp that makes it one of my favorite seasonal moments. And just like every other normal human, all I really want to do is head to the beach or pool...with all of my stuff in this metallic straw tote. Even if you aren't heading anywhere that includes a body of water, this tote would be great to pair with a romper or maxi dress for a day of shopping. Or, in my case, would be the perfect diaper bag! 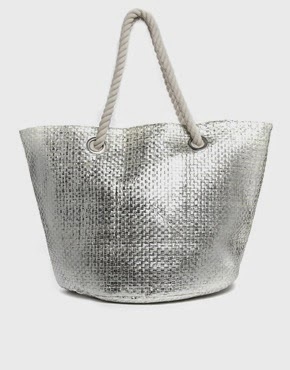 I have been on the hunt for the perfect straw tote for summer and have yet to find it - love the metallic coating on this one and how modern it feels! This may be even better than a plain straw bag... and I was sure that was what I needed. I love this!